FACS profiles for cell cycle synchronization of HCT116 cells pulsed with EdU. Asynchronous (AS) HCT116 cells were treated with CDK4/6i (Palbociclib, 2 μM) for 20 hours to arrest in G0/G1 (middle panel), followed by a wash in fresh media for 8 hours to release into S phase (right panel). In vitro inhibition of mouse corticotroph tumor cells by R-roscovitine. (A) Treatment of ACTH-secreting AtT20 cells with R-roscovitine (1-2 × 10-5 μM) led to decreased number of viable cells at 24 and 48 h, as depicted by Wst-1 proliferation assay (mean ± SE; **P < 0.01). (B) Western blot of protein extracts derived from AtT20 cells treated with vehicle or R-roscovitine. (C) R-roscovitine treatment (10 μM) for 48 h induced senescence as indicated by increased β-gal expression. (D) ACTH concentration by radioimmunoassays of culture medium from AtT20 cells treated with vehicle or R-roscovitine (mean ±SE; **P < 0.01 and ***P < 0.001). (E) Western blot of protein extracts derived from AtT20 cells treated with R-roscovitine. Vehicle is 0.2% DMSO. SNS-032 (BMS-387032) has firstly been described as a selective inhibitor of CDK2 with IC50 of 48 nM in cell-free assays and is 10- and 20-fold selective over CDK1/CDK4. It is also found to be sensitive to CDK7/9 with IC50 of 62 nM/4 nM, with little effect on CDK6. Phase 1. For MTT assays, cells (2,000 ~ 5,000 cells/well) were subcultured into 96-well plates according to their growth properties. Cell proliferation was assayed at 72 hr after treatment of SNS-032 by adding 20 μl of 5 mg/ml 3-(4,5-Dimethylthiazol-2-yl)-2,5-diphenyltetrazolium bromide (MTT) solution per 100 μl of growth medium. After incubating for 3-4 h at 37°C, the media were removed and 150 µl/well of MTT solvent (either absolute DMSO or isopropanol containing 4 μM HCl and 0.1% Nonidet-40) was added to dissolve the formazan. The absorbance of each well was measured by ELx808 (BioTek, Winooski, VT) or Wallac Victor2 (Perkin-Elmer Life Sciences, Boston, MA) Microplate Reader. Viable cells are presented as percent of control, vehicle-treated cells. (a) Western blot for RALB-GTP, total RALB and GAPDH proteins in KG1 AML cells treated for 8 h with DMSO or dinaciclib (representative of three independent experiments). Flavopiridol (Alvocidib) competes with ATP to inhibit CDKs including CDK1, CDK2, CDK4, CDK6, and CDK9 with IC50 values in the 20-100 nM range. It is more selective for CDK1, 2, 4, 6, 9 versus CDK7. Flavopiridol is initially found to inhibit EGFR and PKA. Phase 1/2. (A) After mitotic arrest and treatment with the proteasome inhibitor MG132, HeLa cells were treated with the indicated kinase inhibitors The cells were harvested, and the lysates were separated by SDS-PAGE and immunoblotted for phosphorylated RV[S/T]F (p-RV[S/T]F, top). The blot was quantified using ImageJ software and normalized to the mitotic sample (bottom). MLN8054, Aurora A and Aurora B inhibitor; ZM447439 and hesperadin, Aurora B inhibitors; BI2536, PLK1 inhibitor; flavopiridol, CDK1 inhibitor. n = 3. **P < 0.01, paired Student’s t test. AZD4573 is a potent inhibitor of CDK9 (IC50 of <0.004 μM) with fast-off binding kinetics (t1/2 = 16 min) and high selectivity versus other kinases, including other CDK family kinases. Atuveciclib (BAY-1143572) is potent and highly selective PTEFb/CDK9 inhibitor with IC50 values of 13 nM for CDK9/CycT and the ratio of IC50 values for CDK2/CDK9 is about 100. Outside the CDK family, It inhibits GSK3 kinase with IC50 values of 45 nM and 87 nM for GSK3α and GSK3β respectively. Abemaciclib is a cell cycle inhibitor selective for CDK4/6 with IC50 of 2 nM and 10 nM in cell-free assays, respectively. NU2058 is an inhibitor of CDK2 with IC50 value of 17 μM in an isolated enzyme assay. It also potentiates melphalan (DMF 2.3), and monohydroxymelphalan (1.7), but not temozolomide or ionising radiation. AT7519 is a multi-CDK inhibitor for CDK1, 2, 4, 6 and 9 with IC50 of 10-210 nM. It is less potent to CDK3 and little active to CDK7. Phase 2. Lysates of MDM treated with five-fold dilutions of the indicated compounds (starting concentration: AT7519, 0.5 mmol/l, roscovitine 4 mmol/l) were subjected to SDS-PAGE, transferred, and immunoblotted with antiphopho-SAMHD1, anti-SAMHD1 and anti-Hsp90 antibodies. MDM, monocyte-derived macrophage; SAMHD1, sterile a motif and HD domain-containing protein-1; SD, standard deviation. 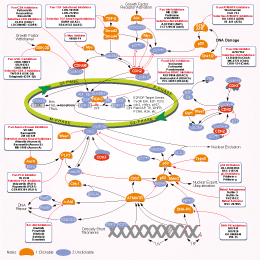 JNJ-7706621 treatment of tamoxifen-resistant cell lines leads to arrest in the G2 cell cycle phase. M phase cells from the upper right quadrants were quantified relative to total G2/M phase cells. Statistical significant differences from vehicle-treated cells are denoted by asterisks; *P<0.05, **P<0.01. AZD5438 is a potent inhibitor of CDK1/2/9 with IC50 of 16 nM/6 nM/20 nM in cell-free assays. It is less potent to CDK5/6 and also inhibits GSK3β. Phase 1. (a) HEK-293 cells expressing V5-EXO1 were synchronized in different phases of the cell cycle. EXO1 was immunoprecipitated (IP) with anti-V5 antibody and Western blotted with anti-phospho-Ser (p-SP) or anti-phospho-Thr (p-TP) CDK substrate antibodies, as indicated. “+AZD” indicates cells pre-treated with the CDK inhibitor AZD5438 prior to analysis. (b) HEK-293 cells expressing V5-EXO1, synchronized in G2, were pre-treated with CDK inhibitors, AZD5438 or Roscovitine, prior to analysis of EXO1 phosphorylation by IP-Western. PHA-793887 is a novel and potent inhibitor of CDK2, CDK5 and CDK7 with IC50 of 8 nM, 5 nM and 10 nM. It is greater than 6-fold more selective for CDK2, 5, and 7 than CDK1, 4, and 9. Phase 1. J558 cells were treated with PHA793887 (0.02–5 umol/L) for 6 hours, after which Western blot analysis was performed to monitor XBP-1s expression. Tub, tubulin. BS-181 HCl is a highly selective CDK7 inhibitor with IC50 of 21 nM. It is more than 40-fold selective for CDK7 than CDK1, 2, 4, 5, 6, or 9. Relative sensitivity of UKF-NB-3 and UKF-NB-3rSNS-032300nM to the CDK2, 7, and 9 inhibitor seliciclib, the CDK7 inhibitor LDC000067, the CDK9 inhibitor BS-181, or the CDK 1,2,4,6,7, and 9 inhibitor alvocidib. SJSA cells were treated with the alternate CDK4/6 inhibitors Ribociclib (LEE011) and Abemaciclib (LY2835219) for 30 h, alone or in combination with Nutlin at 20 µM for 6 h. Immunoblot analysis was performed as in (a). Like Palbociclib (PD0332991), the combination of Nutlin with alternate CDK4/6 inhibitors diminished p53 target gene expression when compared to Nutlin treatment alone. BMS-265246 is a potent and selective CDK1/2 inhibitor with IC50 of 6 nM/9 nM in a cell-free assay. It is 25-fold more selective for CDK1/2 than CDK4. PHA-767491 is a potent ATP-competitive dual Cdc7/CDK9 inhibitor with IC50 of 10 nM and 34 nM in cell-free assays, respectively.It displays ~20-fold selectivity against CDK1/2 and GSK3-β, 50-fold selectivity against MK2 and CDK5, 100-fold selectivity against PLK1 and CHK2. Viability at 250 nM and CI vs. Fa for U2932 following 24 hours exposure to ABT-199, additional drugs with activity against CDK9, or the combinations. Mean of quadruplicates ± SEM. R547 is a potent ATP-competitive inhibitor of CDK1/2/4 with Ki of 2 nM/3 nM/1 nM. It is less potent to CDK7 and GSK3α/β, while inactive to other kinases. Phase 1. IB analysis of whole cell lysates derived from mouse CT26 or 4T1 tumor cell lines treated with or without the CDK4/6 inhibitor, ribociclib. NU6027 is a potent ATR/CDK inhibitor, inhibits CDK1/2, ATR and DNA-PK with Ki of 2.5 μM/1.3 μM, 0.4 μM and 2.2 μM, enter cells more readily than the 6-aminopurine-based inhibitors. P276-00 is a novel CDK1, CDK4 and CDK9 inhibitor with IC50 of 79 nM, 63 nM and 20 nM, respectively. Phase 2/3. Predicted anticancer drugs inhibit the growth of neuroendocrine tumor cells. Multi-tyrosine kinase inhibitors sorafenib, sunitinib, regorafenib and cabozantinib effectively inhibit GOT1 cell growth with IC50 values in the micromolar range. Inhibitors of AKT (MK-2206), HDAC (vorinostat), HSP90 (alvespimycin) and CDK4/9 (P276-00) also inhibited GOT1 cell growth at micromolar concentrations, whereas inhibition of PARP1 (veliparib) had no effect. GOT1 cells were treated with anticancer drugs at various concentrations for 4 days. Cell viability was estimated using AlamarBlue®. Data points are the mean values of three individual experiments carried out in triplicate (n=9). Fitting of curves was done in GraphPad Prism software v6.04 using log (inhibitor) vs response nonlinear fit with variable slope. IC50 was interpolated at Y=50 and bars denote ±s.d. THZ1 is a covalent CDK7 inhibitor which has the unprecedented ability to target a remote cysteine residue located outside of the canonical kinase domain, providing an unanticipated means of achieving selectivity for CDK7. One and three days after differentiation induction, protein level of Myh3 and Myogenin were analyzed by western blot. TG003 is a potent and ATP-competitive Cdc2-like kinase (Clk) inhibitor with IC50 of 20 nM, 200 nM, and 15 nM for Clk1, Clk2, and Clk4, respectively. No inhibitory effect on Clk3, SRPK1, SRPK2, or PKC. HeLa cells were untreated or treated with either colcemid (10 μg/ml for 16 h), RO-3306 (9 μM for 16 h), or both colcemid and RO-3306, as indicated. Cells were then lysed, and proteins were detected by Western analysis. LDC4297 is a novel CDK7 inhibitor (IC50=0.13±0.06 nM for CDK7 versus IC50s between 10 nM and 10,000 nM for all other analyzed CDKs). Senexin A is a potent and selective inhibitor of CDK8 and its nearest relative, CDK19 with Kd values of 0.83 μM and 0.31 μM for CDK8 and CDK19 ATP site binding, respectively. MSC2530818, a CDK8 inhibitor with the IC50 of 2.6 nM, displays excellent kinase selectivity, biochemical and cellular potency, microsomal stability, and is orally bioavailable. Wogonin, a natural and biologically-active flavonoid found in plants, is an inhibitor of CDK9 and does not inhibit CDK2, CDK4 and CDK6 at doses that inhibit CDK9 activity; Also inhibits N-acetyltransferase. Effect of Wogonin on the translocation and transcriptional activity of NFATc1. U2OS cells stably transfected with EGFP-NFATc1, RANKL (100 ng/ml) and different concentrations of Wogonin (5.0, 1.0, 0.1 and 0.0 mM) were added and incubated for 24 h. The IN Cell™ Analyzer 1000 was used to observe the translocation of NFATc1. (A) DMSO was used as a control. RANKL (100 ng/ml) significantly stimulated the translocation of NFATc1; Wogonin (5 mM) significantly decreased the translocation of NFATc1 induced by RANKL (magnification, x200). (B) Statistics showed that Wogonin could decrease the translocation of NFATc1 into the nucleus induced by RANKL in a concentration-dependent manner. RAW264.7 cells were transfected with pGL3-promoter-NFATc1-RE, and then RANKL (100 ng/ml) and different concentrations of Wogonin (5.0, 1.0, 0.1 and 0.0 mM) were added and incubated for 24 h. (C) RANKL significantly increased the transcriptional activity of NFATc1 and Wogonin decreased the transcriptional activity of NFATc1 induced by RANKL in a concentration-dependent manner. n=3; *P<0.05 and ***P<0.001 compared with the RANKL group. NAFTc1, nuclear factor of activated T cells c1; EGFP, enhanced green fluorescent protein; DMSO, dimethylsulfoxide, RANKL, receptor activator of nuclear factor κB ligand; RE, response element. （A）HeLa cells were treated with Nocodazole for 8 hours and then fixed. Before the cells were stained with phospho-specific antibody against S119 of Ajuba, they were pre-incubated with PBS (no peptide control), or non-phosphorylated (control) peptide, or the phosphorylated peptide used for immunizing rabbits. CDK1 inhibitors Purvalanol A (10 μM) together with MG132 (25 μM) were added 2 h before the cells were fixed (bottom two rows).（B）Experiments were done similarly as in (A) with phospho-specific antibody against Ser175 of Ajuba. LY2857785 is a type I reversible and competitive ATP kinase inhibitor against CDK9(IC50=0.011 μM) and also inhibits other transcription kinases CDK8(IC50=0.016 μM) and CDK7 (IC50=0.246 μM). K03861 is a type II CDK2 inhibitor with Kd of 50 nM, 18.6 nM, 15.4 nM, and 9.7 nM for CDK2(WT), CDK2(C118L), CDK2(A144C), and CDK2(C118L/A144C), respectlvely. Kenpaullone is an ATP-competitive inhibitor of cyclin-dependent kinases (CDKs). It also inhibit glycogen synthase kinase 3β (GSK3β) with IC50 of 0.23 µM. Effect of Kenpaullone on GSK-3β and CDKs. (A and B) Naïve CD4+ T cells were stimulated with anti-CD3/CD28 (TCR), TGF-β (5 ng/ml) and IL-6 (20 ng/ml) in the presence of the indicated Kenpaullone (Kenp) concentrations for 30 min (A) or 24 h (A and B). Skp2 inhibitor C1 (SKPin C1) is a specific and selective small-molecule inhibitor of Skp2-mediated p27 degradation by reducing p27 binding through key compound-receptor contacts. ON123300 is a potent and multi-targeted kinase inhibitor with IC50 of 3.9 nM, 5 nM, 26 nM, 26 nM, 9.2 nM and 11nM for CDK4, Ark5, PDGFRβ, FGFR1, RET, and Fyn, respectively. LDC000067 is a highly selective CDK9 inhibitor with IC50 of 44 nM, 55/125/210/ >227/ >227-fold selectivity over CDK2/1/4/6/7. Inhibition of CDK9 leads to a decrease in RNApol II activity and repetitive element expression. HEK293T cells were treated with DMSO control and the indicated amounts of LDC000067, a CDK9 inhibitor, for a total of 3 h. (A) Immunoblots showing the levels of phosphorylated RNApol II largest subunit (pRPB1), total RPB1 and GAPDH, in response to different doses of CDK9 inhibitor. (B) Quantification of immunoblots from 2 independent experiments in which each condition was performed in duplicates, and in which pRPB1 and total RPB1 protein levels were normalized to GAPDH or as pRPB1/Total RPB1 ratio. (C, D) qRT-PCR analyses show a significant response to CDK9 inhibition of repetitive elements belonging to the LTR (C) and SINE (D) classes. Statistical analyses were performed to compare all groups using a One-way ANOVA followed by Bonforreoni’s multiple comparison test, *P < 0.05, **P < 0.01, #P < 0.0001. AT7519 HCl is a multi-CDK inhibitor for CDK1, 2, 4, 6 and 9 with IC50 of 10-210 nM in cell-free assays. It is less potent to CDK3 and little active to CDK7. Phase 2. (c) Effect of AT7519 treatment on RNA pol II occupancy at the PRCC gene. MM1.S cells were treated with either DMSO vehicle (blue) or 2 μM AT7519 (brown) for 6 h, followed by RNA pol II ChIP-seq analysis. Twenty-fold magnifications of the rpm/bp scale of these gene tracks are shown in the right panel to show the difference in reads for elongating RNA pol II. TR, RNA pol II traveling ratio. (d) Genome-wide binding average RNA pol II (ChIP-seq) on active promoters and gene bodies following treatment of MM1.S cells with DMSO vehicle (blue) or 2 μM of AT7519 (brown) for 6 h. Magnification of the rpm/bp scale at gene bodies is shown in the inset. The inset includes RNA polymerase II traveling ratio distributions (TR, mean) derived from MM1.S cells treated with DMSO (blue) or 2 μM AT7519 (red). (e) Chemical structures of the pan-CDK inhibitor AT7519 and its biotinylated counterpart bio-AT7519. (f) In vitro kinase assays with recombinant cyclin T-CDK9 complex in the presence of increasing concentrations of AT7519 or bio-AT7519. The derived IC50 values for each compound are shown. (g) Effect of AT7519 and bio-AT7519 on MM1.S cell proliferation. Cells were treated with varying concentrations of drug for 72 h as indicated. The derived EC50 values for each compound are shown. XL413 (BMS-863233) is a potent and selective cell division cycle 7 homolog (CDC7) kinase inhibitor with IC50 of 3.4 nM, showing 63-, 12- and 35-fold selectivity over CK2, Pim-1 and pMCM2, respectively. Phase 1/2. The protein levels of p-MCM2 and p-ERK in NOK, HN6 and Cal27 cells treated with 0, 10 and 20 μMXL413 were detected by western blotting.